The Neighborhood provides work place options for small businesses, artisans and entrepreneurs, and diverse housing choices for households of all types. Parks and gardens are within walking distance. Front porches provide a comfortable transition between the privacy of your home and the public space of the community. At Holiday Neighborhood, you will find a great lifestyle complete with neighborhood businesses, convenience and community. Holiday Neighborhood has incorporated themes to help preserve our past. If you have lived in Boulder long, you might recall the days of the twin screen Holiday Drive In Theater. The theater operated at the site from 1969 to 1988. We have named Easy Rider Lane after the first movie that brought people to north Boulder. 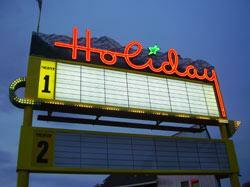 We have also preserved the Holiday Sign, a rare representation of the "googie" style popular in the 1950s.